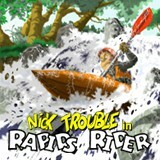 Rapids Rider is a skill-action game currently under development for iPhone platform. It will include many features, like many levels, excellent control, interesting intertia, game modes, nice graphics and music, unlockable extras, and much more. To see info about this game, including a video demonstration, visit its official website. DAGASU is a new independent video game developer group. Our goal is to offer entertainment for everyone creating games. To achieve this, we will try to afford it making full playable games for different videogame platforms.